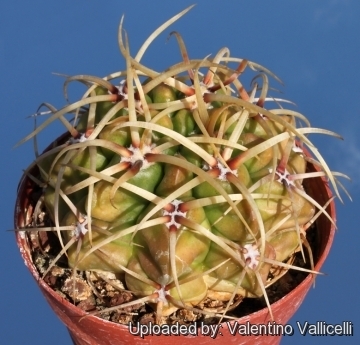 It is a strongly spined and hardy species from Argentina with long stiff yellow translucent spines with a red base on a bright green background. 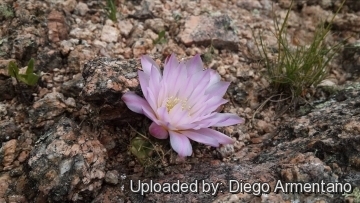 Origin and Habitat: Argentina, Córdoba province (Sierras grandes and Chicas de Córdoba) and San louis province. Gymnocalycium monvillei has a relatively wide range and is abundant. Altitude range. This species occurs at elevations of 500 to 2,700 metres above sea level. Habitat and Ecology:* The species grows in grasslands. The species is collected locally from the wild but this is not a threat to the species. There are no major threats affecting this species. 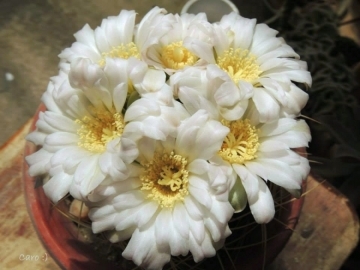 Description: Gymnocalycium monvillei is well-known in cultivation and particularly priced for its pink flowers and characteristic strong spination. It is quite variable and several unnecessary varietal names have appeared in the past. Habit: Simple or eventually forming large clumps. Ribs: 10-17(-20), broad, obtuse, tuberculate with chin like protrusions, especially above, acute. Areoles: Elliptic, 10 mm long. 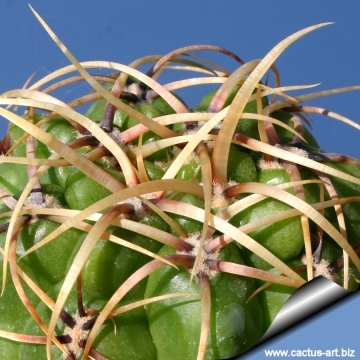 Spines: Stout, thick, slightly curved, yellow with usually reddish bases, often translucent , but also orange, black or reddish. 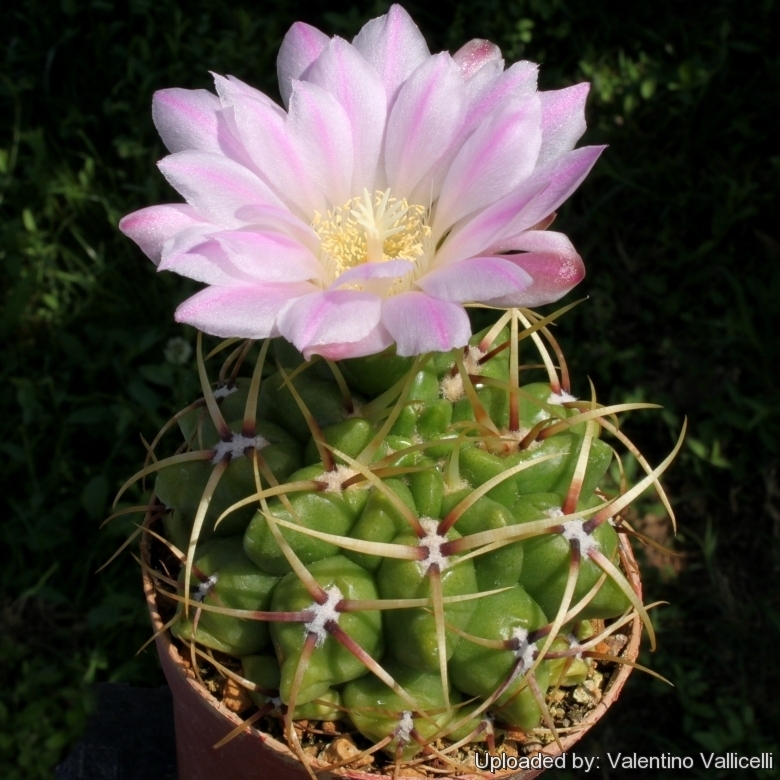 Radial spines:5-7 up to 12, but usually less in young plants, 3-4 cm long, spreading, somewhat flattened against the body, stout, yellowish or whitish with a reddish tinge at the base, the longest one 3 cm long. Central spines: Usually absent, or 1 to 4 erected. 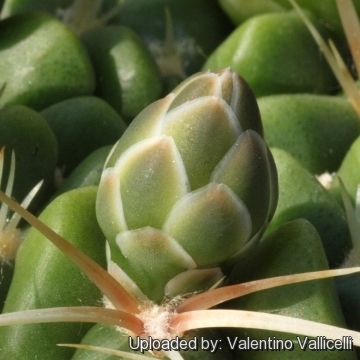 Flower buds: Short ovoid and bullet-shaped, covered with imbricate scales. 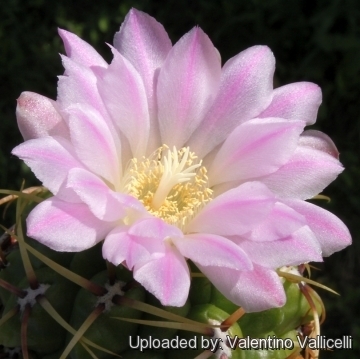 Flowers: Are some of the largest in this genus, often growing larger than the plant!, funnel-shaped 4 to 8 cm long and wide, pink, white flushed with pink or, in some forms, pure white, and often double petaled. Scales on the ovary broad and rounded, their margins scarious. Blooming season: Summer, It takes 5-6 years from seed before flowers. Fruits: Green that became yellowish at maturity, globose, up to 2 cm in diameter. Seeds: Up to 1 mm brownish-red. 6) Demaio, P., Lowry, M., Trevisson, M. & Méndez, E. 2013. 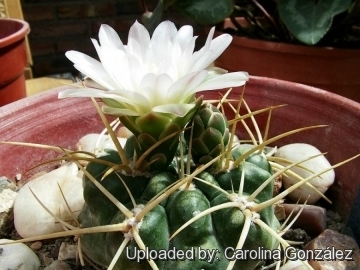 Gymnocalycium monvillei. The IUCN Red List of Threatened Species 2013: e.T152254A615177. http://dx.doi.org/10.2305/IUCN.UK.2013-1.RLTS.T152254A615177.en. Downloaded on 29 March 2016. 7) Kiesling, R. and Ferrari, O.E. 2009. 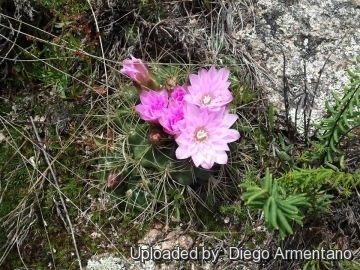 100 Cactus Argentinos. Albatros, Buenos Aires. Cultivation and Propagation: It is a summer-growing species that offers no cultivation difficulty. Water regularly in summer (but do not over-water). Keep rather dry in winter. Feed with a high potassium fertilizer in summer. Hardy as low as -5° C (or less) if kept dry. Sun Exposure: Light shade.